Content Profiles let you configure how Acrolinx reads your content. You'll find Content Profiles under Guidance Settings in the Dashboard. In this guide, we'll go through each tab of the Content Profiles feature in the Dashboard and talk about what the fields are. If you’re using one of the Acrolinx Sidebar integrations, you’ll notice that the Filter and Segmentation options that are available in the Classic edition aren’t there. This is because you can now define how Acrolinx reads your content on the Acrolinx Server so that your writers don’t have to worry about it. On the landing page, you'll see a list of all your Content Profiles. Here you can upload or add a new one. 2 Content Profile shortcut menu. 3 Default system profile. This means that you can't make any changes to this Content Profile, but you can make a copy of it or download it. If you have 2 identical Content Profiles, Acrolinx uses the one further up the list. Name Give your Content Profile a descriptive name. You can include the content type, for example, HTML or the integration, for example, PowerPoint. Description Include additional information that might be important or relevant about this Content Profile. Define how to tell Acrolinx when it should apply this Content Profile to your content. The location of the file or files that the Content Profile applies to. You might use this property when there's no other data available to identify the file type. A file path or a path pattern entered as a regular expression. When you use regular expressions, bear in mind that you need to use the syntax for Java-style regular expressions . If you're not sure if the expression you want to use is valid, you can easily test it with this Java Regular Expression Tester . Type Choose your content type from the dropdown. You might use this for simple XML documents that don't have a document type definition or schema. The root element for HTML documents is always html . The signature that an Acrolinx integration sends when it authenticates with an Acrolinx Server. You might use this identifier for customized Acrolinx integrations such as CMS integrations that don't send a plug-in short name. Only use this matching criterion if no other matching criteria work for you. Matching on the signature means that the Content Profile will only match when writers check from a certain editor. It can be useful if the host editor is the only way of determining the document type. The language of the check as indicated by the Acrolinx plug-in. You can use this property to change the extraction settings based on the language of the content. One scenario might be that you're checking a multilingual XML format such as TMX. You would want to include the parts of the file that match the checking language. Enter the name of the Writing Guide. You could use this criteria if you want a Content Profile to apply to a specific Writing Guide. Starting Element The Starting Element set to ‘include’ works for most cases. This means that Acrolinx will read everything. Default Break Level Define how the text should be broken up, such as sentence break or token break elements. XML processing instructions have their break level set to none by default. You can always set this to a different value if you need to. Mark excluded elements Insert placeholders for excluded elements when processing the text. This property prevents excluded elements causing false issues. Define a whitelist of external DTDs. You need this setting if your Content Profile applies to files that reference external DTDs. For example, if your Content Profile applies to DocBook articles, and those articles reference the DTD "docbookx.dtd", you need to whitelist that DTD. Otherwise, the server will ignore it. You can find out more about how to handle external DTDs in the article Remapping the Source Paths for External DTDs . Tell Acrolinx how you've defined your own entities in your DTDs. Acrolinx replaces the entity with the value. So, for the above example, Acrolinx replaces all instances of '&copyright;' with '©'. As they are, copied from elsewhere. For example, you can use © as value, like the example above. Use the escape notation like '\uxxxx', where 'xxxx' is the hexadecimal Unicode codepoint. For example, you could write copyright=\u00a9 , since U+00A9 is the Unicode codepoint for ©. 1 - Element Name Name of the element without any syntax. For example, if your element is <comment>, then enter 'comment'. Acrolinx matches the element to your content using the Element Name. Always check this content regardless of whether it's nested inside an excluded element. Never check this content but include it in the grammatical structure of the sentence. For example, you might have text that refers to user interface labels. Take the following sentence. Use the Filter Mode of the parent element. If you have elements that contain sentences that don't end with a period, define them as sentence-break elements. This means that the end of the element should always be treated as a sentence end. You might define elements as token breaks if you have words which aren't separated by a space. This setting defines the elements which should cause a token break. Adding a token break is basically adding a boundary between words. Acrolinx doesn't add any break at all. Use the Default Break Level defined above. 4 - Attributes to Extract Attributes in your elements that you want Acrolinx to read. For example, if you had a paragraph element that has the attributes title and subtitle. <paragraph internal="true" title="Title of this paragraph"
If you want Acrolinx to read the title and subtitle, then add 'title' and 'subtitle' to your Attributes to Extract. 5 - Parenthetic Treat the element as separate sentence, even if it's embedded in another sentence. Much of Guidance is context-dependent. Map your elements to the contexts in your Guidance. 1 Select a context from the list or click + to add a new context. 2 Enter the name of the context. You can also change the name of a context. 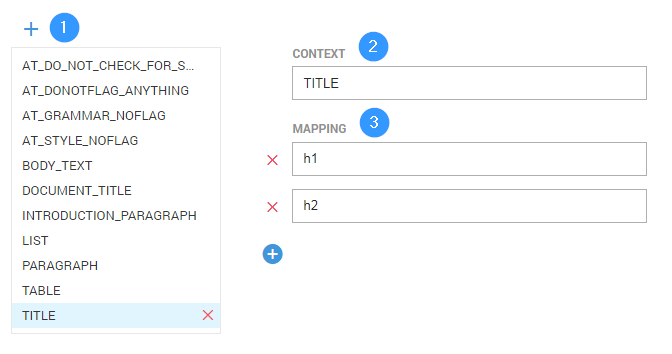 3 The mapping field expects an XPath. List the elements that you want to map to your context. Click + to add a new mapping. 1 Select an issue location from the list or click + to add a new issue location. 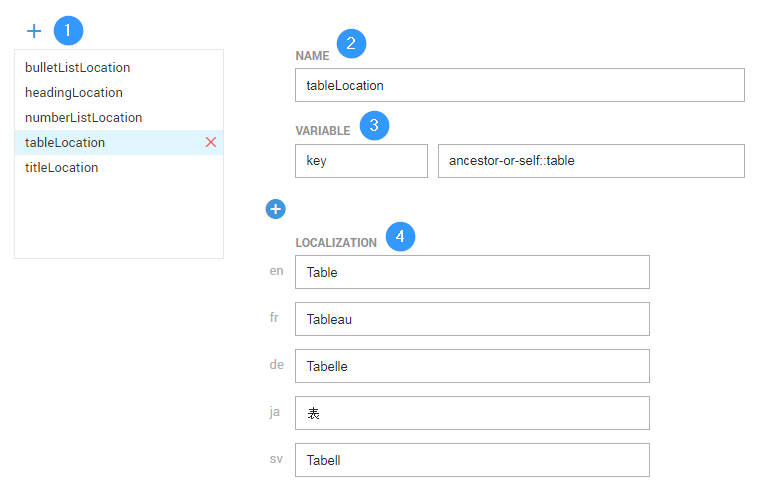 Define the location with XPath. 4 The localization is what appears in the Sidebar that shows the name of the location of the issue.